Jones: "We Gotta Get Better"
Cole Hadley (#9) kicked off the first game of the season and the Cardinals got a quick wake up call as the Mustangs returned it to the Collinsville 15 yard line. Levi Draper (#10), Josh Arnold (#43), and Bradley Smith (#73) stopped this play near the 3 yard line in Oologah's short opening drive. Collinsville stopped the Mustangs short of the goal line on 4th down and took over at their own two yard line at the 10:22 mark of the first quarter. Collinsville's new offense got to start the season from their own endzone following the goal line stop by their defense. Seth Boomer (#12) has handed off to Blake Burd (#22) who made his way out to the 8 yard line on the first play with blocks from Jackson Wilson (#61), Eli Emmitt (#54) and others. Following a Collinsville punt to the Oologah 49 yardline to end their first series, Oologah struck on the next play with a 51 yard TD pass putting them up a touchdown with 6:37 still left in the first quarter. Roc Robbins (#44) was one of several defensive starters from last year that also joined the action on the offensive side of the ball in the 2015 opener. 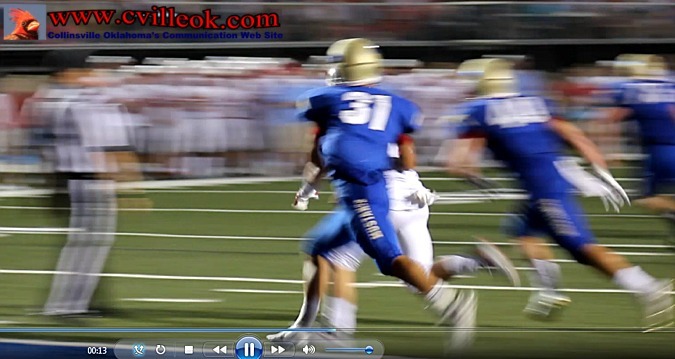 Robbins made a 5 yard gain on this pass play to Oologah's 44 yard line on Collinsville's 3rd series. Marcus Tillman (#24) recovered an Oologah fumble at the 11 yard line (one play after an Austin Roberts punt to the 8) with 8.6 seconds left in the first quarter. Blake Burd (#22) had one carry from the 11 to end the first quarter. Blake Burd (#22) scored on this 4th down pitch play from the 2 yard line early in the 2nd quarter with blocks by Colin Ford (62) and Nathan Schaffner (58) visible in this photo. Cole Hadley kicked the extra point to tie the score at 7-7 with 10:23 left in the 2nd quarter. Oologah ran the ensuing kickoff back to Collinsville's 38 yard line and reached the 14 before missing a field goal at 9:36 in the 2nd quarter. Collinsville fumbled their next punt snap and set Oologah up again with a short field (from the 19) but forced Oologah to settle for a field goal and a 7-10 score at 6:04 2nd quarter. Collinsville defenders celebrate Tyler Forrest's (#1) interception at the Card's 21 yard line with 2:47 left before half time. 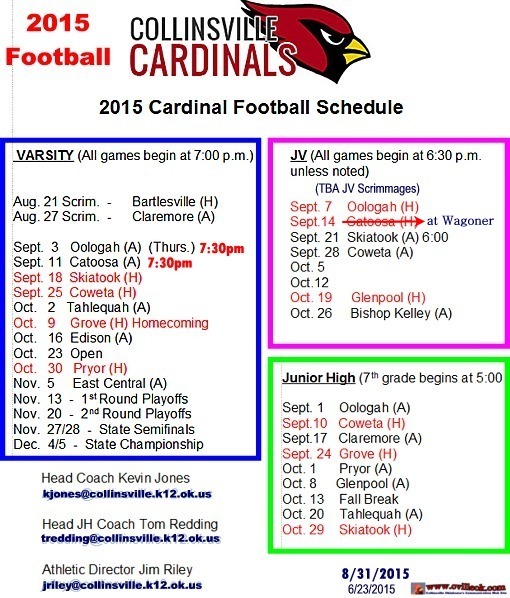 Oologah had intercepted the Cardinals on the play before at the 43. Oologah covered 63 yards total, including this 25 yard TD pass, to go up 7-17 just 35.8 seconds before halftime. The Collinsville Crimson Cadet Band performed their 2015 (RA, sun god) marching show at halftime. Collinsville took the 2nd half kickoff at their own 29 and drove to the Mustang 15 (mostly on the legs of Blake Burd #22) before settling for a Cole Hadley field goal (below). Cole Hadley (#9) with the hike from Roc Robbins (#44) and the hold of Brandon Lowe (#2) added 3 points for a 10-17 score at 7:12 in the 3rd period. Connor Cross (#79) provided the snaps to QB Seth Boomer (#2) with Roc Robbins (#44) in a fullback position in front of Marcus Tillman (#24). Oologah went up 10-24 with 1:05 left in the 3rd quarter on a 78 yard drive. A short kickoff gave Collinsville the ball at their own 44. Marcus Tillman (#24) carried the ball into Oologah territory with the handoff from Seth Boomer (#12) and blocks by Colin Ford (#62) and Jackson Wilson (#61) late in the 3rd quarter. Seth Boomer (#12) tossed a 46 yard TD pass to Brett Erickson (#11 below) on the 2nd play of the 4th quarter. Brett Erickson (#11) scored with the Boomer pass at 11:34 in the 4th quarter and the score closed to 17-24 following Hadley's kick. Collinsville held Oologah to a 3 and out series early in the 4th quarter and then drove (from their own 36) down to Oologah's 8 yard line for what they hoped would be a tying score. The drive stalled with this 3rd down Boomer pass beyond the reach of Levi Draper (#10) on 3rd down (and the 4th down play below). I switched to video for this key 4th and 8 play at the 6:11 mark of the final quarter. Seth Boomer's pass to Brandon Lowe might have been catchable if Oologah's #31 hadn't restricted Brandon's arm motion just before the pass arrived. The pass was incomplete and no flag was thrown and the ball turned over with no points. Oologah followed with a scoring drive capped by a 66 yard run to pad their lead to 17-30 after their extra point attempt hit the post and was no good. Brett Erickson (#11) hauled in this 45 yard Seth Boomer TD pass with 1:56 left in the game to pull within 6 at 24-30 following Hadley extra point kick. Hadley's onside kick didn't travel 10 yards and Oologah was able to run out all but 6.6 seconds of the clock before one final Collinsville desperation pass fell incomplete to end the game.